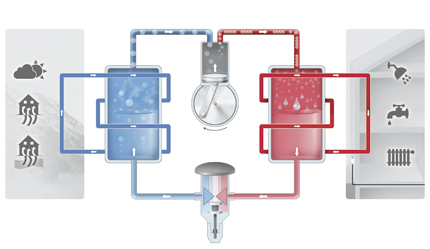 The principle of the heat pump was developed back in the 18th century. What originally arose from a need to cool food is now used in the heating and air-conditioning of buildings. To monitor pressure and temperature measuring parameters in heat pump circuits, different measuring principles can be employed. In the case of pressure measurement, this programme extends from the tried and tested Bourdon tube pressure gauge, with or without electrical output signal (PGT) or switch contact (PGS), right out to electronic pressure measurement. To monitor the temperature of a heat pump, multiple versions of screw-in, plug-in and contact sensors are available. With the temperature sensor TF41 you also create a reliable connection between your controller unit and the ambient temperature.